Some marketers hear “big data” and their heads spin. They know it can be valuable, but it also can be a mess of multiple databases with divergent fields, formulas, and more. They see data as their marketing kryptonite. To see this kind of data as a treasure chest – as a means to be more effective in your content marketing – I suggest you use the word “personalization” when you talk big data. Big data affords you the opportunity to customize content for your target audiences (far beyond “Dear Jane”). It enables you to deliver the most relevant content to your audience members the way they want it, when they want it. Now, put on your mining helmet. 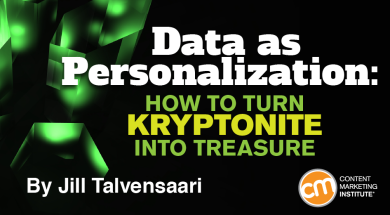 We’re going to hunt for treasure by looking at three types of personalization information and find out how to get the most from the one you (probably) know the least about. First-party personalization is the information about your customers that you own. How much data your brand owns likely depends on your type of business. Direct B2C and B2B companies like IBM, Akamai, IKEA, and the Gap can usually learn a lot from information provided by their customers – what they buy, how they buy it, how they followed the buying cycle, etc. Companies that don’t sell directly to the retail customer have less first-party information available. Consider Procter & Gamble’s Clorox brand. The company can access information about its consumers directly from rebate cards or redeemed coupons. It also has information from its social media sites as well as its customer service centers. What it doesn’t have is a transactional relationship with its customers. It’s free – you already gathered the data as part of your business operations. It doesn’t hit privacy land mines – your customers already consented to share their data. It provides high-quality data – you can learn from customer-browsing patterns, point-of-sale transactions, and more. You also can use the information to build profiles of your ideal customer and use those profiles or personas to create content that resonates with potential customers, too. Second-party personalization information comes from your partners. For example, Clorox obtains information from its distribution partners – the retail outlets such as Target or Costco that sell the product directly to the consumer. Clorox can gather data from the retailer related to points of sale, credit cards, etc. Think Apple and their worldwide sales network, direct and indirect, and all the data mining that can happen there. It comes from partners who usually are connected to your customers in more ways than a direct transaction. Third-party personalization is information that your company acquires (buys) to better identify and understand your target audience. Data-collection companies (third parties) can be great sources for information about your target audience. But third-party information is a different beast. You have to purchase it, so it can take up a significant chunk of your content marketing budget. It can, however, provide richer insights into markets than first-party data can because it brings together information from a wide variety of data sources. In the old days – before localization and visualization – manufacturers could buy information based on ZIP codes – and later the four-digit extension to narrow it to 10 households or less. Now, you can get information down to the individual. You can find out what car a person owns, what memberships they have, what magazines they subscribe to – you can get really personal with information from third parties. With that information, you can create and distribute content on a much more personal level. You can target the individual, giving him the content you know will help him when he needs it on the channel he most frequently uses. It enables you to overlay market data with your own data. It allows you to create more robust personalization because you have more information about your audience than your direct or indirect transactional data provides. When I worked as a marketer for a solar-panel company, my dream was to have the budget to buy a list of Toyota Prius owners. It was a natural fit – Prius owners typically are more environmentally concerned and more likely to pay for a product that helps the environment. While we couldn’t afford to find out who owned Priuses and target them, we still tailored our outreach. We invested in radio advertising in targeted geographic markets and mailed postcards to promote free personal assessments. In conjunction with the advertising, we developed screening criteria (personalization) based on our own and third-party information to qualify the prospects who called for free evaluations. Through publicly available data from the electric company, we knew prospects who spent more than $150 a month on their electric bills were most likely to benefit from our solar panels. We also input the prospect’s address in Google Earth so we could see whether their roof was visible (if not, they likely didn’t have enough sun to use our product). We would see whether they earned at least $100,000 a year because even with the rebates available, solar panels are expensive. We also could use other third-party information to learn whether they belonged to Greenpeace, Nature Conservancy or Sierra Club – all environmentally focused groups. With that information, we were able to have a better conversation and go deeper with the prospects. If the prospect lives on a tree-covered property, you could deliver content that educates the person about how to trim their trees to allow more sunlight. If the prospect is spending at least $150 on their monthly electric bill, you could deliver content that shares the story of someone who went through an energy audit and found long-term savings by making changes to their utilities – including the addition of solar panels. If the prospect earns at least $100,000, you could deliver content that highlights the experiences of influencers who opted for and benefited from a green lifestyle. While achieving 100% one-to-one marketing is the ideal personalization goal, don’t strive for the ideal. Set a manageable goal that’s more achievable. How can you make progress to pull all the information your company has from first-, second-, and third-party sources into an effective content personalization strategy? Don’t make the C-suite your first stop. Just ask a room of marketers if they have their content marketing experiments blessed from the higher-ups and you’ll see only a few hands go up. The C-suite typically doesn’t have the stomach to delve into personalized content marketing. They aren’t willing to accept that ROI could take two to 18 months or that the company will need to invest resources and commit to the change required. Instead, create a pilot personalized content marketing program. Start by documenting your personalization strategy. Initially, focus on first-party data and other low-hanging fruit. Gather input from whichever department in your company is experiencing the biggest pain around personalization and/or data integration. Work with that group so they become your internal evangelists. As others hear about the success, they will want to get involved (and the C-suite will take notice of the successes). Eventually, so many people will want to participate that a systematic approach is realized. Use individuals’ purchasing habits and behaviors to trigger the delivery of one-to-one personalized content. Easy-to-implement example: You go online and buy two warm coats in children’s sizes 8 and 10. A week later, you receive an email from the retailer that includes an article about how cold is too cold to let your children play outdoors. Think regionally (or another niche of your target audience) and deliver content relevant to people in that group. Easy-to-implement example: You go online and purchase towels from a home-goods store. The retailer hasn’t learned that much about you – except that you need to dry something. However, the retailer knows from your ZIP code that you live in a cold-weather climate. In November, the retailer sends you and all its other customers in your region an e-newsletter that includes an article about preparing your home to survive the winter. By pulling together all the data into a single source of truth across all systems, you can know your audience on that in-depth level. Thus, your content can be personalized – relevant to the individual customer, delivered on the most appropriate channel, at the time the customer wants or needs it. A single source of truth for your data also enables you to evaluate what content is most effective with your audience members. For example, if 10,000 people download your white paper and three people convert, is that content achieving what you want it to? Now that you have access to all the information, you can make the proper evaluation. When you can integrate your personalization data, including getting your marketing technology systems talking to each other, that’s when you can get truly personal, and your content marketing success will be greater. Sign up for our Content Strategy for Marketers newsletter, featuring exclusive insights from CMI’s Chief Strategy Officer, Robert Rose. If you are like many other marketers we meet, you’ll come to look forward to his weekly thoughts. Editor’s note: IO Integration is a Content Marketing Institute benefactor, which is a paid supporter of our website and content creation activities. Jill Talvensaari is marketing vice president at IO Integration, a leading marketing technology provider that helps the world’s top brands automate and personalize customer experiences. She lives in the Santa Cruz Mountains above Silicon Valley with her family, two dogs and two cats. Jill holds degrees in Econometrics and Cognitive Science from UCSD, and an MBA from Seattle University. Follow Jill on Twitter @moxiemktg.